Eczema is so annoying. You never know how you got it in the first place and it never seems to go away no matter what you do. It turns you, often without warning, into this fussy consumer you used to swear you would never be. Alas, you now have to bite your tongue. Woe betide me. And you, the one who also has silly eczema problems. I hope you’ve learnt to embrace it as part of who you are. I mean, it’s not as if we have a choice. But there’re always ways to make life a little bit better. 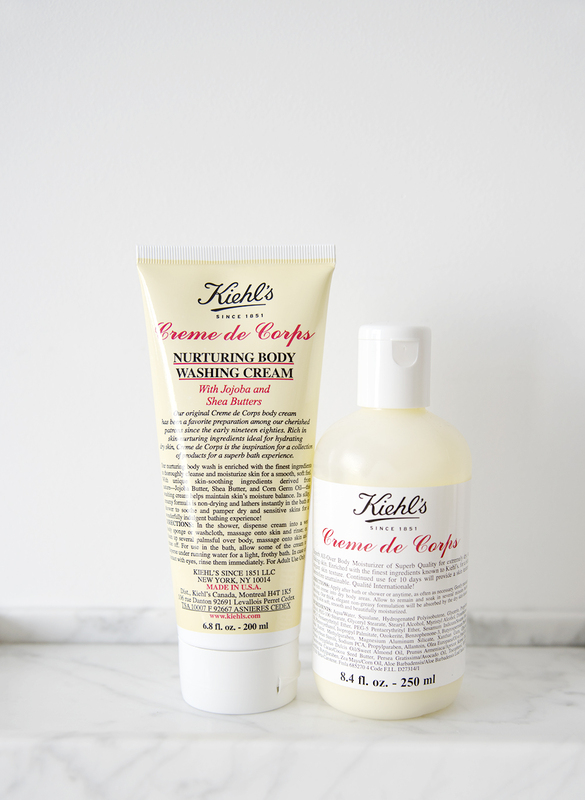 Today, I’m quite delighted to share with you a couple of products I tried and loved – the Kiehl’s Crème de Corps Nurturing Body Washing Cream and Body Moisturiser. Click on the individual tabs below to read my in-depth reviews. I’ve never had something more luxuriously perfect for sensitive skin – at least not yet. Truth be told, this is the first body shower product I’ve ever tried for eczema sufferers but I can safely say I do like it. It doesn’t aggravate any itchy patches or cause any more to appear. It smells like pure milky soap – and also looks like it. Squeezed out of the tube, it looks like creamy sunblock. It lathers only minimally, as it does not contain ingredients that promote it. I love it that there is no fragrance in this – and it’s important to know that the ingredient “fragrance” can be used to label a thousand and one things under the sun. So, because there is no fragrance, at least we all know what exactly is in this product. However, you’ll notice several parabens in the ingredient list. Aqua/Water, Myristic Acid, Palmitic Acid, Disodium Laureate Sulfosuccinate, Potassium Hydroxide, Zea Mays/Corn Germ Oil, Lauric Acid, Stearic Acid, PEG-7 Glyceryl Cocoate, Cocamide MEA, Glycerin, Phenoxyethanol, Butyrospermum Parkii Butter/Shea Butter, Disodium EDTA, Cetyl Hydroxyethylcellulose, Polyquaternium-7, Methylparaben, Simmondsia Chinesis Butter/Jojoba Butter, Xanthan Gum, Propylparaben, Butylparaben, BHT and Aloe Barbadensis/Aloe Barbadensis Leaf Juice. The Kiehl’s Crème de Corps Nurturing Body Washing Cream is non-irritating, non-drying and moisturises skin well. It currently retails at S$35 for a 200ml tube, which is pretty expensive for a shower product. To compare, the Bioderma Atoderm Gel Douche, which I currently use daily, retails at S$23.50 for a 500ml bottle. I wouldn’t get this as a daily product to use, but it’s perfect for a gift or for special pampering sessions, such as staycations or a Friday night relaxing time in the shower. I love this Body Moisturiser from Kiehl’s mostly because it is very deeply hydrating. That’s all thanks to the second ingredient in the list, squalane, and the other plant oils in it. I once had a bad reaction on my eczema patch to some product, where my skin was basically red and raw from all the mindless scratching I did. That very night, I applied this moisturiser on that parts that were sore, and then as a booster and moisture lock added another thin layer of my PHB Skin Repair Gel (read my review here). Not only did it not hurt the skin at all, but everything calmed down by so much the next day. I swear this can only be a miracle. Like the Nurturing Body Washing Cream, the Body Moisturiser is fragrance-free. However, the ingredient list is longer and it also contains parabens. Aqua/Water, Squalane, Hydrogenated Polyisobutene, Glycerin, Propylene Glycol, PEG-100 Stearate, Glyceryl Stearate, Stearyl Alcohol, Myristyl Alcohol, Dimethicone, PPG-5 Pentaerythrityl Ether, PEG-5 Pentaerythrityl Ether, Sesamum Indicum/Sesame Seed Oil, Phenoxyethanol, Isopropyl Palmitate, Ozokerite, Benzophenone-3, Butyrospermum Parkii/Shea Butter, Methylparaben, Magnesium Aluminium Silicate, Xanthin Gum, Glycine Soja/Soybean Sterols, Sodium PCA, Propylparaben, Allantoin, Olea Europaea/Olive Fruit Oil, Prunus Amygdalus Dulcis Oil/Sweet Almond Oil, Prunus Armeniaca/Apricot Kernel Oil, Theobroma Cacao/Cocoa Seed Butter, Persea Gratissima/Avocado Oil, Tocopherol, BHT, Lecithin, Butylparaben, Zea Mays/Corn Oil, Aloe Barbadensis/Aloe Barbadensis Leaf Juice and CI 75130/Beta-Carotene. This product comes in two sizes, 250ml and 500ml. The smaller one retails at S$60 and will last for a pretty long time, so I recommend getting this first before you’re sure you want to commit to it. The 500ml bottle retails at S$90 and though it’s more value for money, it can actually be a waste if you won’t end up using all of it. I’m not sure if Kiehl’s sells these two products in promotional gift packs, but if they don’t, they totally should. Both of these together make for a great gift, especially for those who have dryer, more sensitive or more mature skin. In addition, Kiehl’s states the manufacturing dates on each product, so you’ll have an idea when it should be thrown away – if you don’t finish it up first. For the environmentalist in you, you’ll be glad to know that the packaging material is also recyclable. If you are a regular at Nordstrom, you can get these for slightly cheaper including international shipping charges. Check out the Nurturing Body Washing Cream here and the Body Moisturiser here if you don’t mind the wait. Review: The Kiehl’s Crème de Corps Nurturing Body Washing Cream & Body Moisturiser was last modified: May 19th, 2016 by Roxanne C.